Four elementary school pupils were taken to the hospital with minor injuries, FHP troopers said. 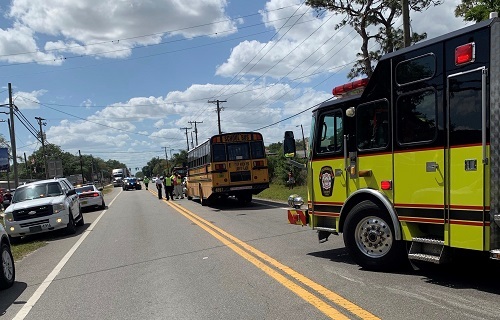 HILLSBOROUGH COUNTY – Four children were injured and a Hillsborough County school bus driver was cited after a crash Thursday on U.S. 92, the Florida Highway Patrol said. The four children who were taken to hospitals attend McDonald Elementary School. They had minor injuries. Also suffering minor injuries were Amber Jean McGuire, 32, of Thonotosassa, who was taken to Brandon Regional Hospital, and Bryan Winston Lecount, 43, and Sharika Lasheek Brewer, 37, both of Tampa, who were not taken to a hospital. Tara Jan Crawford, 32, of Thonotosassa, the bus driver, was not injured. FHP troopers cited her for careless driving. The crash happened about 2:24 p.m. on westbound U.S. 92 approaching Williams Road in Hillsborough County. Troopers said Crawford was driving the Hillsborough County school bus, which had 14 pupils from McDonald Elementary aboard, when she hit the rear of a 2002 Saturn Aura driven by McGuire, which was stopped in traffic. The impact pushed the Saturn into the rear of a 1999 Toyota Solara driven by Lecount.